Lebanon's mountains are being wiped from the map – does anyone care? Posted on the Independent June 2018. Rarely are journalists lost for words. But how do you describe the destruction of entire mountains, the slashing down of tens of thousands of pine trees, the very shape of the landscape changed by more than 3,000 quarries which have ripped apart the geography of Lebanon and made a new map of its blessed and ancient land – the Massacre of the Mountains? Is that good enough for a story which should shock the world if it occurred in Europe or America? I call it the Castration of Lebanon. Its fruits are dirt and crumbled rock and contaminated lakes. The tops of entire mountainsides – millions of tons of sand and rock – have been ripped away by diggers, excavators and bulldozers to provide concrete for Beirut’s canyons of grotesque high-rise apartments: for its villas and gated city suburbs and the Lebanese Mediterranean coastal hotels. Greed, corruption, poverty and a shameful, selfish, confessional government are to blame. Even now, as Lebanon’s sectarian parties fight for seats in a new cabinet, their nation is being physically torn apart. All they need to do is pass a law – just one piece of legislation – to stop this anarchy. “Your Lebanon is a political knot, a national dilemma, a place of conflict and deception,” the nation’s most famous poet, Khalil Gibran, wrote in despair of his country almost a hundred years ago. Come with me to Mayrouba, high on a mountain above Bikfaya, where Elias Saadeh stands on a plateau of mud and broken rock and roads – government highways – which end suddenly in sheer 500-foot chasms of stone, carved and hacked at by giant cranes and stone cutters whose claws have grooved out the inside of these mountains. Ridges, valleys and watercourses have disappeared. “There is not a building in the ‘new’ Beirut,” Saadeh says cynically, “which does not have part of Mayrouba in its walls and foundations. They call our land here ‘gold sand’ – the best you can buy to build apartment blocks, and it’s the most expensive. But this is crazy. The two of us stare out towards mountains we’ve known and looked at for decades – but the mountains are not there. For this is now a lunar landscape whose creeping fog and damp winds prove that image reflects reality. We are looking at a lost land. Why? “Because the people who did this are not educated,” Elias says. “Because they only see the dollar. These people make $5,000 a day. They made people rich, but they remained uneducated. They have never learned how to love land. Saadeh sounds like a modern-day Gibran. The poet’s body lies scarcely a hundred miles to the north, sealed into a cave, his tomb weighted down with chains in case his worshippers try to take his bones. “Splendid mountains” indeed. Elias Saadeh’s tale is one of courage and political victory – for the moment, at least – because he and nine fellow villagers here in the Kesrouan mountains fought through the presidency and the courts to stop the 500 trucks, night and day, tearing away their forests and mountains. But when I tell you of his work, beware: the rest of this story is one of ugliness and tragedy. The landscape is being further blighted each day and I was soon to watch the actual destruction of a mountain-top – in front of my very eyes – outside a small town called Tarshish. No problem, the sand and rock was being taken for “government projects”, I was told. But like a tiresome detective, I trailed one of the excavators’ trucks, packed with sand, down the mountains of Lebanon – and watched its contents poured into the private construction of a company selling sand to build more apartments in Beirut. Of which, more anon. The ten members of Saadeh’s “Save Mayrouba” group say they discovered that 16 companies were quarrying 20 per cent of their village’s area. “They didn’t buy the land,” he says. “They bought a lease from the government – even if it was illegal to quarry. So they got permits to ‘clean’ the land! “They got help from past governments – from ministers of environment, interior, industry and from the local authority. Our fathers and grandfathers tried to stop this before us – but then they didn’t have social media. We had a court order for the quarries to stop but after five days the trucks came back and the local police facilitated them. Elias Saadeh and his friends took action through the courts and the district judge in Kesrouan stopped the destruction of the mountains around Mayrouba with a court order. Her ‘cease work’ order of 1st March this year is tied with string to the mechanical diggers still standing on the blighted hills – although mud tracks suggest some of the vehicles have been moving in recent days. Saadeh has been frightened. “I got phone calls at night during our campaign,” he says. “People said: ‘We are going to kill you’. They are very angry. Amazing, isn’t it? Some of the quarry companies were ordered to replant the trees. Twelve lopsided bushes on one broken mountain appear to be the response. The Christian church, primarily Maronite, is the biggest landowner in Lebanon although the spoliation of the country has been committed across hundreds of miles, affecting Muslims and Christians alike. I spent hours driving through Christian villages, their Ottoman stone houses smothered in bougainvillea and roses, past roadside shrines of the Virgin, with the Maronites’ own Saint Charbel an optional extra. But when I reached the heights above, it was the same grim landscape. Take Tarshish. It stands below a sliced and ravaged mountain that overlooks – or overlooked – the Bekaa Valley. This week, I watched the trucks carrying away its sand and stone. But like so many of those who witness or participate in this catastrophe, the site manager, Charbel Hayek, was friendly, cheerful, offering coffee and providing a mobile phone map of how the terrifying hole in the mountain behind him would be filled with terraces for new vineyards – to grow the regions’ famous ‘Adyar’ (‘Monasteries’) wine. But it seemed – like the other ravaged cliffs on the other side of the road – far too deep for repair with just a few earthen steps of vine trees. Hayek, who expressed his own sorrow at the blight of quarrying, showed me an ancient hermit’s stone house – at least this had been preserved – and insisted that the sand and stone being convoyed out of the mountains was to be used for “airport projects in Beirut and government projects”. He worked for the Saint Antonious monastery at Beit Shebab near Bikfaya, he said. It all seemed simple enough. But as we left Tarshish, another truck load of sand, partly covered with a tarpaulin, pulled out of the quarry onto the main road and headed west. And for three hours, down gorges and up forested hills – and past other quarries — we followed the big Mercedes lorry. Was it going to the airport? Or a government building project? Readers will no doubt follow its trail with the same growing bafflement as we experienced. For when the truck, driven by a Syrian refugee, eventually reached the Mediterranean seacoast, it did not turn left towards Beirut but north, and then, just before the town of Jounieh, up into the low hills where it made a three-point turn on the main road and arrived at the iron gates of a 55-year old private construction company. I ran inside before the gates were closed and watched the driver upend his truck, the sand from Tarshish spilling to the ground beside tons of other dirt and rocks. The concrete was used for housing. “My sand helped build those houses over there,” he said. “I built these roads.” So much, then, for Hayek’s government projects. So I visited the Antonious monastery in Beit Shebab. The priest to whom I should speak about Tarshish was away, but I was told I might visit Frederic Cacchia, the monastery’s French wine-maker, several miles away. Cacchia, a 44-year old from Marseilles with a Lebanese wife, was all charming and offered a taste of the latest Adyar vintage. He had no control over quarries but when I asked if the massive excavations at Tarshish could really be turned into terraced vineyards, he replied with a sigh. “Not in my opinion,” he said. I returned to Beit Shebab to meet the priest whom I had been told was in charge of Tarshish. Father Badih El Hajj of the Universite Saint Esprit de Kaslik, a music scholar, was intelligent and again all smiles – coffee provided, as usual – and agreed with me that the destruction in the mountains was “Catastophique! Catastrophique!”. But then Father Badih said that he was not in fact the priest in charge of the Tarshish area. I would have to speak to Father Maroun in a monastery in the coastal town of Antelias. And, of course, off I headed to Antelias and there was Father Maroun Audi. But, reader spare me, it seemed that while this Father Maroun managed lands below the heights of Tarshish, the top of the mountain was managed by another monk of the same name! He was Maroun Chidiac. No matter. What Maroun Audi, who looks after a cow farm for the monastery, avocado and apple trees and makes arak, had to say was astonishing. And Father Maroun agreed it was “not necessary” to blast away rocks and sand on top of windblown, cold Tarshish to plant vineyards. 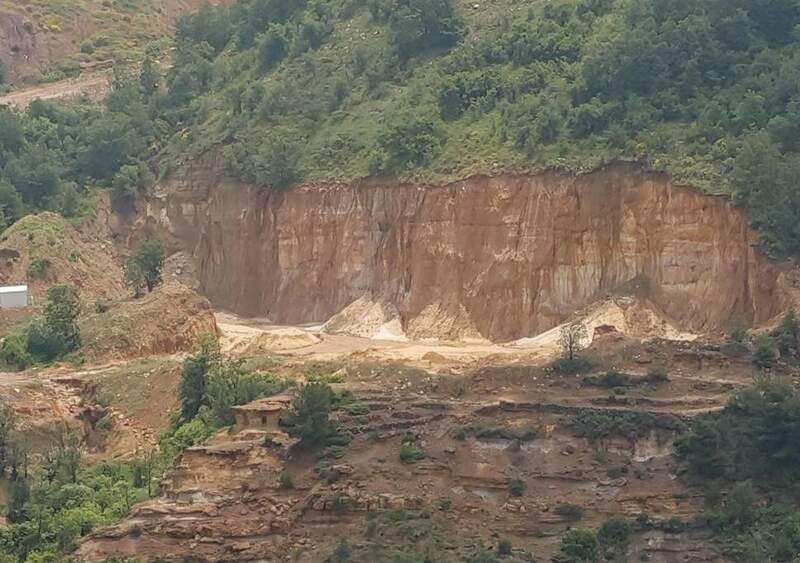 The monk said he had blocked the selling of sand from the area he controlled, about 500 square metres, until the Lebanese Maronite Order could make a decision. He agreed that there were some within the church who had no problem selling sand and rock. There was a big problem in Mayrouba because the church land was owned by another order. Incredibly, the destruction of Lebanon’s mountains has attracted little interest in the local press and none outside; the last printed article on Lebanon’s environment in the international media appears to be a story in an American newspaper last year about dog poo in Beirut. But the small Beirut French-language paper L’Orient Le Jour carried a courageous supplement in March which exposed in a detailed analysis and pictures the awesome damage being done to Lebanon. Reporter Suzanne Baaklini wrote of how the government closed its eyes to quarry owners who are “past masters in the art of getting round the law”, of how a 2007 law on quarrying was passed by the cabinet but never submitted to parliament, how further legislation was inexplicably delayed in 2012 and disappeared when the Beirut cabinet fell the following year. Everyone, the quarries, the priests, the villagers share one thing in common: their condemnation of the government. And the only man who can conceivably halt the despoliation of his country is the new prime minister designate Saad Hariri, son of the former premier Rafiq Hariri who was assassinated in 2005. That’s sectarian Lebanon for you. But if Rafiq’s son Saad – a Sunni, too, of course – can enforce laws to stop his nation’s physical destruction, he will become one of Lebanon’s great prime ministers. By then, of course, it may be too late.